I began my Oom Yung Doe training during the summer of 1987 in Arlington, MA, when I was 25 years old. The year before, I'd seriously injured my knee in a snowmobile accident. Having been very athletic in both high school and college and never having been a "gimp" before, I wanted to find a way to heal my knee more holistically than default to the prescribed route of surgery. A friend of mine at the time was training at the Burlington, MA School and he suggested I give Oom Yung Doe a try. He said, "You won't be disappointed." It's now the year 2000. I've been training for 13 years. 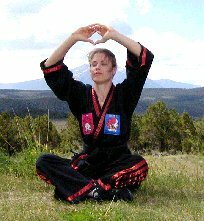 I'm 38 years old, a Fourth Degree Black Belt and presently earning the position of Assistant Regional Head Instructor. I can honestly say that I've never been disappointed in my training or the results I've achieved through my training. Challenged, yes; frustrated at times; but never disappointed. I've derived more from my training than I would have dared to hope for in 1987. What initially appeared to be an obstacle to my training, i.e. my knee injury, turned out to be one of the best vehicles for learning about myself that I've known to date. I vividly remember one conversation in particular with an Assistant National Instructor when I was a Fourth Section student. He asked me what was more important, Patience or Determination? I just looked at him, thinking, "This has got to be a trick question. I'm going to get it wrong no matter what I reply." But after a few minutes of going round and round in my head, I replied, "They're both important, if you don't have determination, you won't achieve your goals, but if you don't have patience, you won't achieve them either." I am using patience as an example, because patience is something that I've struggled with, well, FOREVER. As I once said to my mother growing up, "I think I skipped the patience line when I was getting ready for my journey through life." Funny thing is, I had a decent amount of patience when it came to others, but almost none when it came to myself. However, I can track the progress that I've made in this arena over the years. After my First Degree test, I started writing down my test scores, so that I could look back and see both what I needed to work on and where I'd improved. It's proven to be an invaluable tool for me. Learning how to accept my injury and fully own how I had become injured in the first place enabled me to then work with my knee, not against it, to heal it. That process was an incredible self-education; it took many years and required me to develop a lot of patience with myself. Nowadays, as an Instructor when I see a student "fighting themselves," i.e. not accepting one of their current limitations, be it physical or mental, I am reminded of myself and my own personal journey. The confidence, patience, strength of character, and perseverance that I developed through my training has been invaluable to my professional success. I had just begun my career in the high-tech field when I started my training in 1987. I spent the first ten years of my career working my way up to a director level position at Lotus Development Corporation before venturing into the land of Internet startups. And now, most recently I started my own Internet consulting business. The quality of my relationship to myself, to my future husband (also an Instructor), to my family and friends, to instructors and students, clients and my employees continues to improve as I continue to train and develop my ability to effectively communicate. I will forever be grateful to Grandmaster Iron Kim and the many qualified instructors under whom I have trained for passing on the knowledge of Moo Doe. My training continues to prepare me and help me to deal with life's many challenges and lessons. 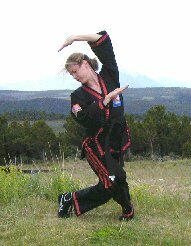 Throughout history, millions of people all over the world have enjoyed the many benefits of traditional Moo Doe (martial arts) training. The importance of correct Moo Doe training has not diminished over the centuries. The main emphasis still remains on developing and strengthening the individual mind and body. Through the practice of correct Moo Doe, one learns determination and the ability to use full concentration toward specific goals, and to single-mindedly continue until you accomplish whatever it is you set your mind to. By using one's concentration and willingness to change and better one's self, one can earn a longer, healthier and happier life. In the United States alone, for over the past twenty-five years, hundreds of thousands of individuals have enhanced their lives, reached their goals and achieved healthier, happier lives through Oom Yung Doe/Chung Moo Doe training. This is an example of unsolicited testimonials from instructors and students who have practiced Oom Yung Doe /Chung Moo Doe martial arts. Their experience varies from a few months to many years of training. A wide range of age groups and diverse backgrounds, they have all enjoyed the common bond of tremendous personal benefit from traditional Moo Doe training. They are united in their desire to improve themselves and in their determination to succeed. Their words are proof that "What you see is what you can achieve."